Next to Normal is not a light and happy feel-good musical. It's a gut-wrenching, emotionally exhausting musical, but in the best, most satisfying way. In what is arguably the best-written musical of this century, themes of loss, grief, mental illness, family dynamics, drug abuse, codependent relationships, and suicide are explored. Heavy stuff for a musical, but that's what I love about it. 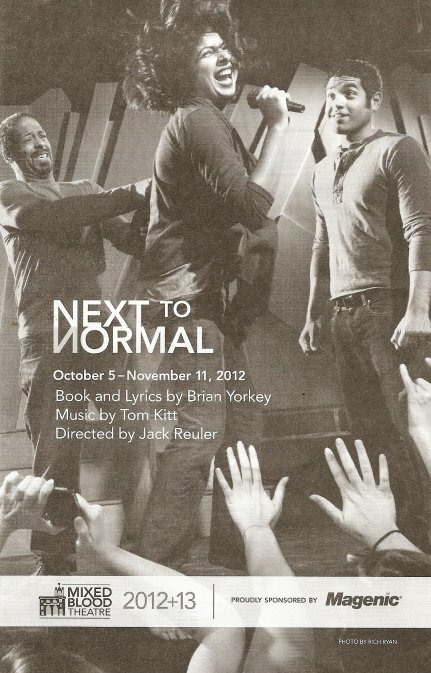 Next to Normal shows us just how deep, real, relevant, and meaningful musical theater can be. I've seen the Broadway production three times (including once on tour at the Ordway last year), but I'm always curious to see what a local theater company does with a familiar musical. Mixed Blood Theatre does an amazing job with this brilliant piece. They put their own spin on it, including a racially diverse cast, completely different sets and costumes, and recasting one of the male characters as a female, while retaining the moving story and driving rock score of the show. Next to Normal is about your typical American family - mother, father, sister, brother. But this family is not as happy and "normal" as it appears. The mother has been suffering from mental illness (bipolar, depression, schizophrenia) for years, and the father is desperately trying to hold everything together for the family. The children are dealing with family issues on top of normal teenage issues like school pressure, drugs, and dating. All of this is told boldly and beautifully through music, with little spoken dialogue. The Tony-winning score is driving and edgy with some incredibly harmonies among the small cast. This is not an easy musical, but the actors and musicians (led by Music Director Jason Hansen) sound terrific (with some band members doubling as actors when needed). This is a really well-cast show. Aditi Kapil is fierce, vulnerable, and raw as Diana as she goes through the ups and downs of her illness (a role that won Alice Ripley a Tony). Thomas W. Jones II is strong and sympathetic as her husband, trying to make everything all right. As the favorite son Gabe, Ricardo Vazquez is a dynamic presence with a strong voice. The final member of this family is tough but fragile daughter Natalie, played by Brittany Bradford. The more I see of Brittany, the more I like her. She's played such diverse roles as Gary Coleman and Sarah Brown Eyes, and again nails this role with her gorgeous voice and expressive face. The multi-talented Tom Reed is Natalie's sweet and supportive boyfriend Henry. The Natalie/Henry relationship is the one bright spot in this drama, a hope for the future that their lives can turn out better than Natalie's parents. Rounding out the cast is Regina Marie Williams as Diana's doctor, a role typically played by a man. It's not a huge change and doesn't really affect the story, perhaps making the doctor seem more sympathetic to Diana. But if you have the chance to cast Regina in any role, take it! The set of the Broadway production of Next to Normal is so much a part of the show that I was curious to see how Mixed Blood would do it in their smaller space. In Broadway the set was comprised of three levels with the actors running up and down stairs to the different levels, almost representing different levels of consciousness or thought. Mixed Blood has turned their black box theater 90 degrees, so it's long and shallow. There's only one story to the set (designed by Joseph Stanley), but with some stairs and platforms so we still get some sense of different levels. And I was fascinated by the set pieces, moving blocks of gray that open up to reveal bathroom cabinets or lamps or a bookshelf. The costumes are also much different than the Broadway production, and successfully so. The Broadway costumes were sleek and business-like, but these costumes (designed by Mallory Kay Nelson) are more homey and colorful. The color and pattern are an interesting contrast to the darkness of the piece. And it makes more sense that a woman struggling with depression would put on a comfy sweater and house slippers rather than heels and a pencil skirt. It's so interesting how this musical plays with ideas of "normal" - what is a normal family, what is a normal reaction to tragedy. And the conclusion is there's no such thing as normal. As Natalie tells her mother, "I don't need a life that's normal, that's way too far away, but something next to normal would be OK." That's really the human struggle, to make a life that's next to normal despite the sadness and setbacks we all have to live through. "The price of love is loss, but still we pay, we love anyway." In other words, you might want to bring a few tissues when you go to see the show. If you've never seen Next to Normal, now's your chance to see one of the best musicals of the last few years. And if you have seen it, you'll want to check out this production and see it in a different way. Playing now through November 11 at Mixed Blood Theatre.